Shake up your ambience by lighting this craft cocktail-inspired soy wax candle. 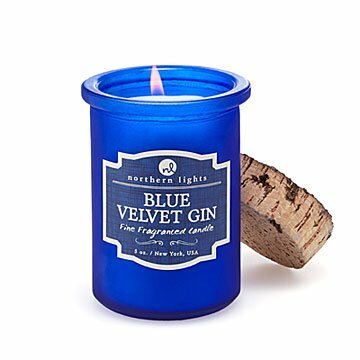 Shake up your ambience by lighting this craft-cocktail-inspired candle. The long-burning soy wax is infused with a spirited scent that turns any time into happy hour. Blue Velvet Gin is as complex as its signature drink—a spectrum of citrus mixed with freshly steeped juniper berries, black currant, and musk. The frosted glass jars topped with natural cork lids (because nobody likes a dusty cocktail) offer snippets of trivia worthy of your favorite bartender—like a bit about Degas' infamous Absinthe Drinker, the cafe scene that caused a stir when unveiled in London. A great gift for your favorite mixologist or cocktail crew, this candle will have them calling for another round. Made in Wellsville, New York. 4.25" H x 3" Dia. Trim wick to 1/4" (3mm) before lighting. Love the blue container with the cork lid. This candle is not only attractive to look at but also has a pleasing, not overpowering smell.